As pointed out recently at a show I’m a sporadic blogger. I’ve been hard at work trying to prepare for my early season onslaught of shows, and blogging has been thrown to the wayside. Not having any experience at Maryland Sheep and Wool I’ve been nervous at the quantity of work necessary to make my first showing a reputable one. So I’ve been living in the studio and going to teach, not much else. Well, there is one thing I’ve been doing too – although biology is taking over for that one. 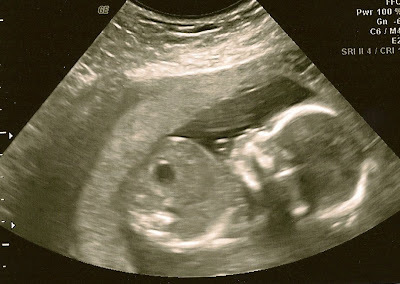 My summer schedule is topped with our first child due in September. Mr. Lanners’ Pottery and I are thrilled – and a wee nervous at my busy summer schedule. Fortunately I have the greatest support system around. My family and friends are jumping at all the opportunities to help me in the studio, drive to, and work with me at shows. If all goes well, the little guy or girl will be making it’s fiber fest debut at New York Sheep and Wool! This entry was posted in Uncategorized on April 23, 2009 by Jennie. Not sure if I’ll be at any of your summer events. Congratulations! I’d offer to help at Michigan, but I’m not sure that I am going to be there–too close to Sock Summit. I’m sure your mom is thrilled. YIPPIE!!!! I’m so happy for the two of you! I can’t wait to see your new addition. Let me know if you need any help. I’ll be a bit busy with the wedding this summer but I’m sure I’ll have some free time to pitch in for such a good cause. CONGRATS! oh! CONGRATS TO YOU AND YER LITTAL WEE ONE!!! ooooh sept for baby snuggles! look at that sweet little angel………..ooohhhh, brings tears to my eyes. The great wonder of amazing life! I saw the post title and no kidding, immediately thought “baby!”. yay, I’m so glad I was right! How very wonderful. Oh my goodness that is fantastic!! How exciting. I do hope everything goes well so I can see you again at Rhinebeck AND meet your little one! (personally I think you are very brave). You know you are going to love that baby; you just have no idea how much. I was so happy to meet you at the festival. You are so kind and so very talented! I’m just seeing this- a big hige congratulations!! So excited for you! WOW! Congrats! So happy for you both!